It's easy to think entrepreneurs must work in a vacuum to succeed, but no man is an island. We are each other's best resource. Creativity is, in fact, stimulated by collaboration. Fellow artists, business owners, even those working alongside us in the same industry often have valuable insights to share. And when we join forces to create—we have the opportunity to inspire and push each other to new and exciting places. Over the summer, fellow letterer (and fellow Southerner) Cory Smith and I first connected over coffee. We have both been in Chicago for a few years now, but recently discovered each other's work. Once we met, it didn't take us long to discover how much we share in common. Cory is a hand-letterer and letterpress printer, and I'm so excited to introduce you guys to her work. 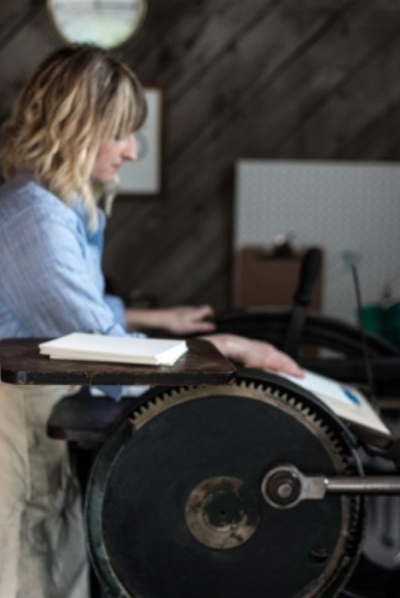 She has such a heartfelt way of weaving together the richness and history of letterpress with her modern and thoughtful paper goods. It is such a pleasure not only to know her, but also to follow her journey in the studio. I highly recommend checking out her work. Like me, she’s also a (sometimes homesick) Southerner with a love for antique shopping and complicated recipes. Having so much to talk about, it wasn’t long before we began to entertain the idea of an artistic collaboration. Over several weeks, we hammered out the idea to create a set of recipe cards. We both like to cook, and more, enjoy eating well. So we settled on making a cook-through-the-year set—twelve cards, three each of four unique season-specific designs. To begin, we took some time to brainstorm and illustrate some of the plants, herbs, and flavors that we associate with each season. When that was done, we traded artwork and worked to incorporate each other's into four distinct card designs. Once we'd settled on a sturdy paper and an understated grey ink, we took the designs to print! We hand-fed each piece on a Chandler and Price printing press before embellishing it with hand-painted watercolor accents. The recipe cards are wrapped in a hand cut vellum envelope and sealed with a white pineapple wax seal, a classic symbol of hospitality. We love these cards as a gift of warmth, friendship, and welcome for loved ones or for your own kitchen. Creating these as a team was such a fun process for the both of us. It was so helpful to be able to trade feedback with another artist when making decisions, to learn from each other's processes, and to have a partner in their production. To celebrate their release, we’re proposing a good ole fashioned recipe swap. That’s right, dust off your community cookbook, find your favorite recipe, and pass it on! As the Midwestern weather sets in, we’re already drooling over pumpkin, apple, roasted root veggie everything. Bring on the warm spices and endless batches of soup with cornbread. Share the love of some of your favorite flavors by writing out a recipe on a card, snapping a picture with the hashtag: #seasonalrecipeswap this month. We’ll repost some of our favorites! 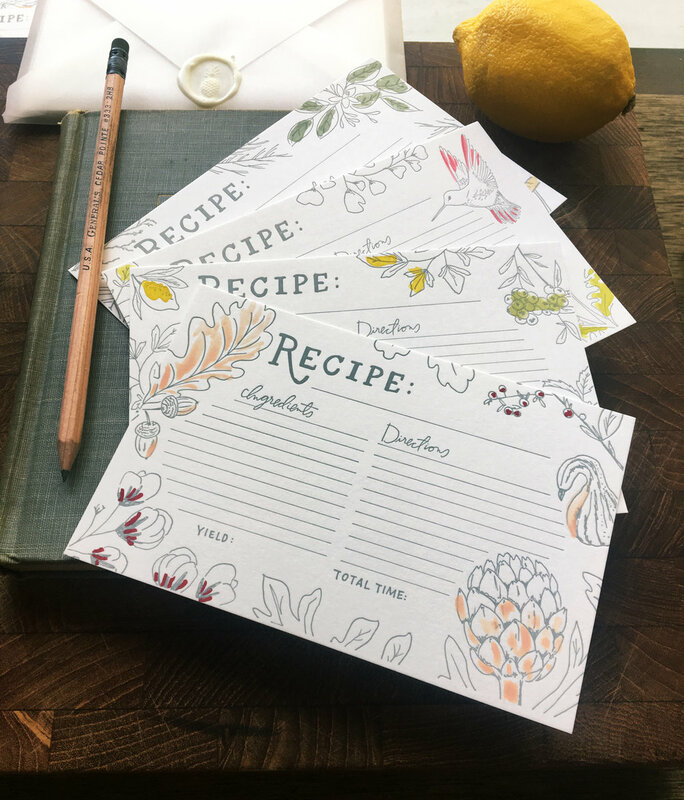 Purchase a set of recipe cards here.